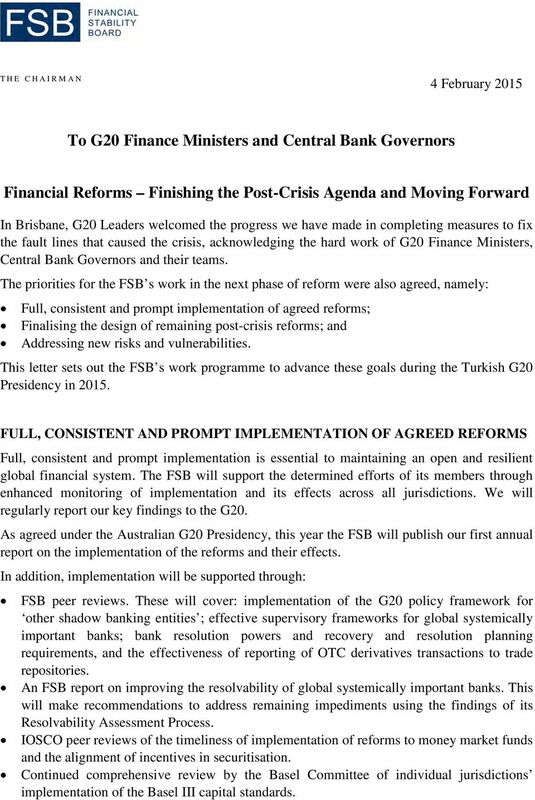 Download "To G20 Finance Ministers and Central Bank Governors. Financial Reforms Finishing the Post-Crisis Agenda and Moving Forward"
1 THE CHAIRMAN 4 February 2015 To G20 Finance Ministers and Central Bank Governors Financial Reforms Finishing the Post-Crisis Agenda and Moving Forward In Brisbane, G20 Leaders welcomed the progress we have made in completing measures to fix the fault lines that caused the crisis, acknowledging the hard work of G20 Finance Ministers, Central Bank Governors and their teams. 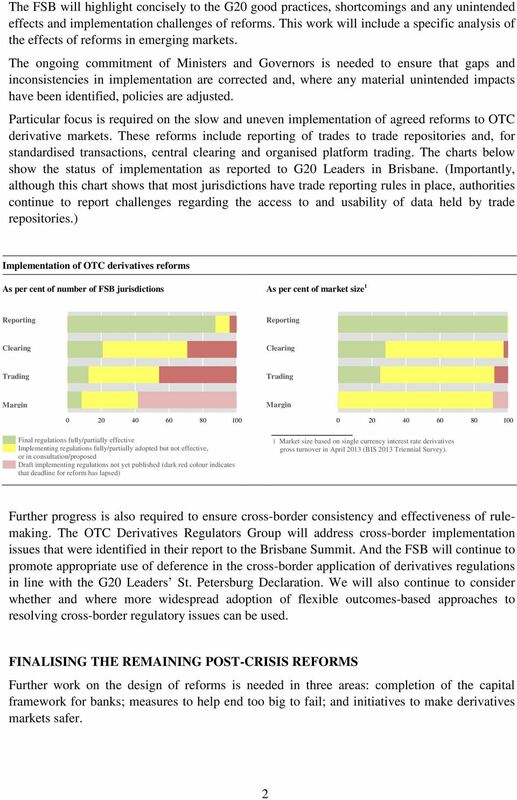 The priorities for the FSB s work in the next phase of reform were also agreed, namely: Full, consistent and prompt implementation of agreed reforms; Finalising the design of remaining post-crisis reforms; and Addressing new risks and vulnerabilities. 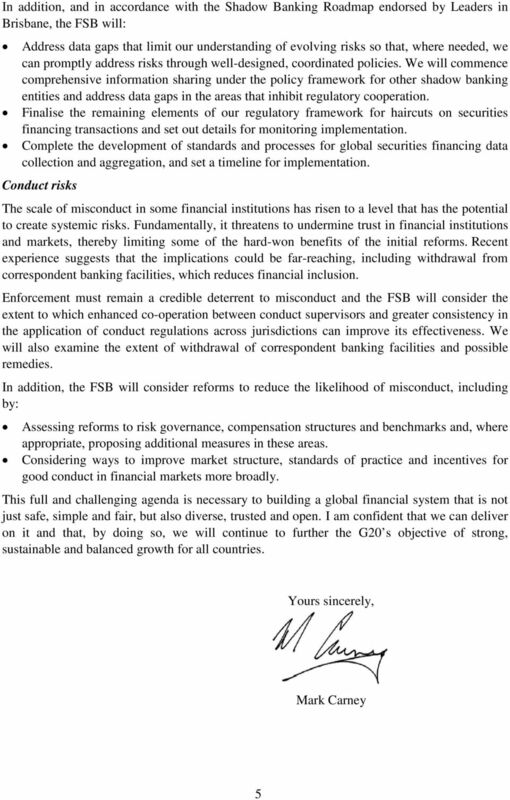 This letter sets out the FSB s work programme to advance these goals during the Turkish G20 Presidency in FULL, CONSISTENT AND PROMPT IMPLEMENTATION OF AGREED REFORMS Full, consistent and prompt implementation is essential to maintaining an open and resilient global financial system. The FSB will support the determined efforts of its members through enhanced monitoring of implementation and its effects across all jurisdictions. We will regularly report our key findings to the G20. As agreed under the Australian G20 Presidency, this year the FSB will publish our first annual report on the implementation of the reforms and their effects. In addition, implementation will be supported through: FSB peer reviews. 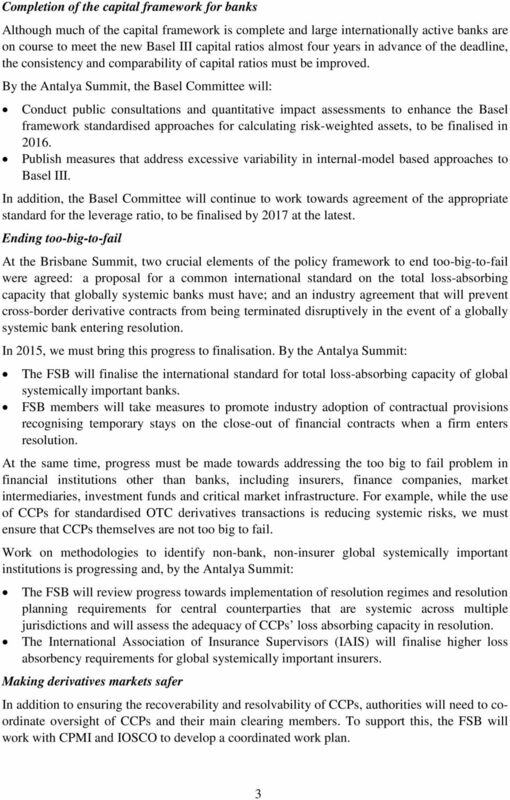 These will cover: implementation of the G20 policy framework for other shadow banking entities ; effective supervisory frameworks for global systemically important banks; bank resolution powers and recovery and resolution planning requirements, and the effectiveness of reporting of OTC derivatives transactions to trade repositories. 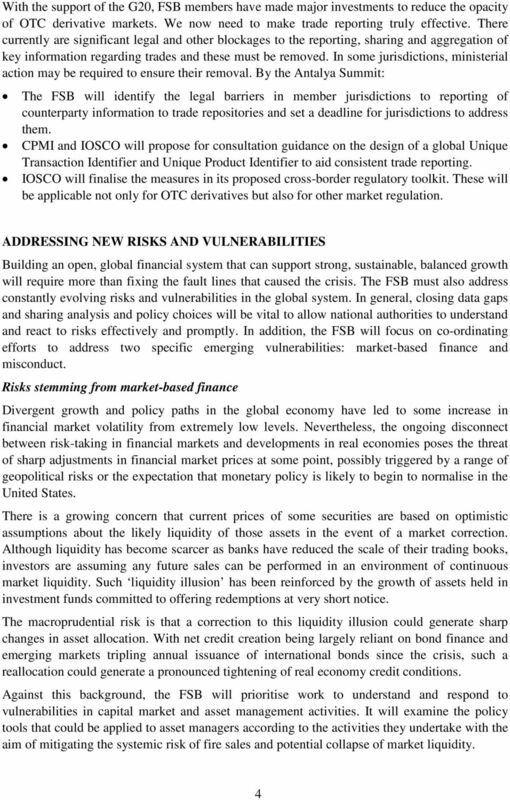 An FSB report on improving the resolvability of global systemically important banks. This will make recommendations to address remaining impediments using the findings of its Resolvability Assessment Process. IOSCO peer reviews of the timeliness of implementation of reforms to money market funds and the alignment of incentives in securitisation. Continued comprehensive review by the Basel Committee of individual jurisdictions implementation of the Basel III capital standards. Gaps and Duplicative Requirements, August 30, 2013, available at http://www.cftc.gov/ucm/groups/public/@newsroom/documents/file/odrgreport.pdf. Communiqué. G20 Finance Ministers and Central Bank Governors Meeting 14-15 April 2016, Washington D.C.
Basel Committee on Banking Supervision Reducing excessive variability in banks regulatory capital ratios A report to the G20 November 2014 This publication is available on the BIS website (www.bis.org). For release on delivery 9:30 a.m. EDT May 12, 2011 Statement by Ben S. Bernanke Chairman Board of Governors of the Federal Reserve System before the Committee on Banking, Housing, and Urban Affairs U.S.
and Supervising Financial Issued on 21 May 2014 Page 2/26 PART A Overview... 3 1. Introduction... 3 2. Broad approach... 4 3. Scope of application... 7 PART B Prudential Framework for Financial... 16 4. FX Week conference "State of play, state of flux: a regulator's perspective"
G20 s Global Derivatives Transparency Mandate January 2015 About DTCC With over 40 years of experience, DTCC is the premier post-trade market infrastructure for the global financial services industry.